No of Brick in one Cycle: 10 Size: 230x110x75. Cycle time of the Machine – 15 seconds + system pressure – 200 Tons. Hydraulic System Double Gear Pump Free Fill System. Oil tank Capacity – 450 liters for System and 68 Hydraulic Oil. Weight of the Main Moulding Machine: 5500kg (5.5 Tons). Dimensions Height – 2700mm. Width – 1400mm and Length:3500 mm. Operating system - Electro Hydro Mechanical. Control: World’s best "Schneider" PLC and Accessories. Functions: Manual / Semi Auto / Fully Automatic. Power requirement: Hydraulic Motor 15H.P. Oil cooling Pump Motor: 1H.P, Pallet Hydro Pump Motor: 5H.P. Pallet out Chain Conveyor Motor: 1HP. Model Specifications are subject to change for improvement without notice. No of brick in one Cycle: 15 Size: 230x110x75. Cycle time of the Machine: 16seconds + system pressure - 260 Tons. Oil Tank Capacity: 650liters of System and 68 liters of Hydraulic Oil. Weight of the Main Moulding Machine: 7500kg. Dimensions H3400xW1600xL9000MM. Operating system Electro Hydro Mechanical. Functions: Manuel / Semi Auto / Fully Automatic. 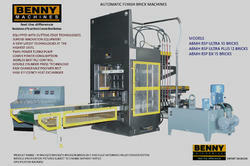 Looking for Hydraulic Fly Ash Brick Making Machine ?